Arts mean different things to different people. Some say it is not a thing, it is a way, while others say it is not an end but a process, or that art is a way to find oneself and lose oneself at the same time. Whatever you think art means, what is clear is that the field of arts is boundless, immense, individual, and confusing. 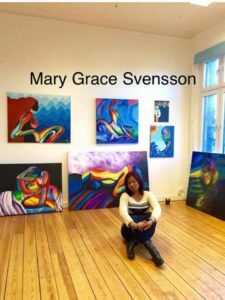 For some Filipino artists residing in Sweden, art has been a form of their self-expression; their resistance to homesickness,; their form of discovery and development; their escape from personal troubles; the hobby they live for; their window of economic opportunity; and their way of living. 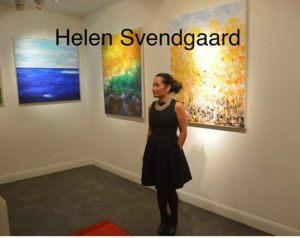 Through the years, many Filipino artists in Sweden have been cultivating their love for the arts individually. There has not been a group in the field of arts that they could call their home – until the Filipino Artists´ Association (FAAS) came to be. FAAS traces its humble beginnings to 3 talented artists, Aya Sunga-Askert, Mary Grace Svensson, and Helen Svendgaard, who individually yearned for a creative avenue that could open opportunities for them to exchange their ideas, sharpen their skills, and showcase their labor of love. What started out as a casual conversation on a planned exhibit ended up in the discovery of their mutual dream. Not long after that casual discussion, the wheels of their dream were set in motion. 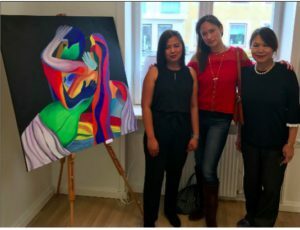 In fact, on the 14th of April 2018 at Citykonditoriet in Stockholm, the first ever meeting of the Filipino Artists´ Association was held. Everyone was nervous, excited, and in awe that Filipinos with passion for the arts now finally have something to call their own. The FAAS today proudly brings together veteran and emerging visual, performing, and literary artists residing in Sweden with Filipino heritage. This includes painters, poets, writers, singers, actresses, photographers, and fashion designers. The group is not just about organizing art exhibits or auctions; the group encompasses a wide array of activities to suit the needs of each of its members. FAAS offers assistance in personal projects; the group teaches Filipino language to children; translates Pablo Neruda poems from English to Filipino and conducts workshops, among other things. FAAS continues to serve as an association that addresses the burgeoning interests of Filipinos in the field of arts. The association wants to cultivate artistic talents by providing them the exposure and the necessary practical experience needed for each member to have sustainable careers in the field of arts and for each member to have a platform where they can freely develop as a person and as an artist. More than just directly supporting artists in a commercial sense, FAAS wants to foster the next generation of art patrons, to forge deeper appreciation and commitment to the arts for its members, and it wants to form an unbreakable bond among its members so that they may flourish together. FAAS believes that there is so much potential to be harnessed by coming together. One of the goals of the organization is to showcase filipino competence in the international field of arts. FAAS encourages Filipino artists who are based in Europe to form their own association for collaboration, mentoring, and networking with them. ”We believe that one is strong but together we are stronger”, expresses Grace, one of the co-founders of the association.